Did you know I bought strawberries at the store today? 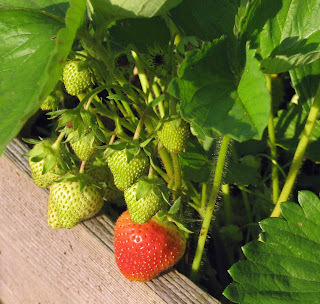 Then I went out to the garden to see what was going on and found the first of the ripe strawberries. I didn't pick a lot of berries this evening, a couple dozen maybe. I ate half of them and will take the rest of them to work for my lunch tomorrow. By tomorrow evening, there will be more ripe berries ready for me to pick. Now I need to figure out what to do with those store bought strawberries. I "tweeted" on Twitter a few days ago that the neighbor's cat thinks that my raised bed vegetable garden is his giganetic litter box. It. Is. Not. So now I don't like to see that cat in my garden, even if he does keep rabbits away. He has been declawed, so he shouldn't be outside, anyway. And there are city ordinances about not letting cats roam freely outside, and there is a neighborhood covenant restriction about it. That cat should not be in my garden. Anyway, I put something on Twitter a few days ago about how irritating it was to find that the cat had dug in my raised bed, the one where some peppers are planted, and used it as his personal litter box. Moonsanity twittered back that I should put twigs or rose canes on the beds to keep the cat out. I didn't have any rose canes, but my neighbor had a large half dead willow shrub of some kind and she "let" me cut out all the dead branches I wanted. So I cut them off and hauled them back to the garden and now several of my beds look like the one above. 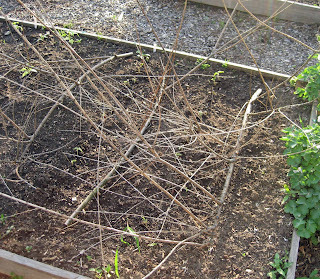 This bed, by the way, has some green beans coming up, so I laid some branches between the rows to see if it would also keep the rabbits out. But let's not start the week worrying about cat poo and bunny rabbits. 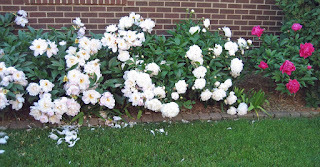 Instead, you can see what peonies look like after a heavy downpour hits them. I don't try to support my peonies with anything, but after seeing this picture, I might try to get some supports for next year. It must be hard for those peony plants to hold up all those blooms after awhile. A flower that needs no support are these simple white irises. 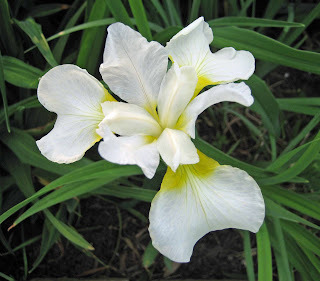 This iris looks like it could go to a wedding, all dressed in white with a hint of gold. June is a big month for weddings and my niece is going to be a June bride in a few weeks. I have just one piece of advice to offer her, advice that I saw stitched on an old sampler. I offer it as a muse for June. "If you would plant a lovely garden, then you should have a lovely life." Do you think sticks in the vegetable garden and peonies hung over like floosies after a night on the town make for a lovely garden? I do! 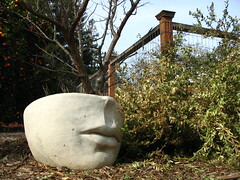 Enjoy your week in your garden. Until I sniffed out the answer. I put a bunch of society garlic in the cat's favorite spot. That's what the garden center lady advised me to do, but I don't think it helped. Turns out a few sprinkles of society garlic is nice on pizza. You could have had peony bouquets all over your house! I brought in several of the heaviest blooms before the rain. It is so sad to see them all flopped over after the rain. Carol, those sticks look like they should do the job! I like the 'sage' advice. Sorry to hear the pretty flower was a weed. Even so, I liked the look of it. I use rose canes, and that does deter animals from bothering that section of the garden. I don't have a problem with cats, but digging armadillos drive me crazy. Love the photo of the white iris. It is lovely. I am in complete agreement with your June musing. Having a lovely garden definitely defines having a lovely life to me. We have cats in the neighborhood too, but they never bother my garden. I always have my dog with me when I garden. I think that keeps them away. It helps keep the bunnies away too, but the bunnies will get aggressive later when their population increases. I love your drooping peonies! Isn't that what they are supposed to look like? Mine are budded up but not yet blooming! On cats, I hope that trick works for you. Cats can be difficult! Maybe an outside litter box of the cat would help. Chuck B... I'll let you know if the branches help keep the cat from digging. Robin's Nesting Place... I sure could have... next time. Beckie... It was pretty, but when I went outside and pulled it that evening, it was already closed up. Jan... I'll bet the armadillos aren't stopped by a few lightweight branches. Carolyn Gail... Thank you and I suspect many of us feel that way. Daphne... No dog here, so it is just scary ol' me trying to keep the cats, and rabbits, out of the garden. Layanne... Yes, peonies are supposed to look like that! And on the cat litter, uhhhh... NO. I don't "do" cat litter. Gail... Thank you and I suspect more than a few of us garden bloggers have a few thoughts about our neighbors' pets getting in our gardens. Thanks for the comments, now I'm off to see if the cat has been digging in the garden. I write on the calender at the beginning of April every year "support the Peony." It's very hard to support them once they've started blooming. (Been there, done that too many times.) Get something big & sturdy, as mine has outgrown its little 3-ringed hoop. Some people use upside down tomato cages.